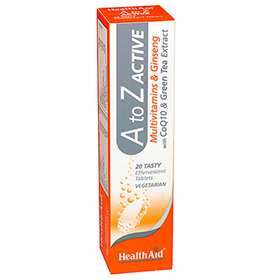 HealthAid A to Z Effervescent Tablets is made from a careful balance of comprehensive vitamins and minerals that are recommended on a daily bases to keep you feeling 100%. Comprehensive balance of multivitamins, minerals, CoQ10, green tea and ginseng. Fulfils recommended daily intake of vitamins and minerals. Free from aspartame, yeast, gluten, soya, dairy, salt, artificial colours and flavourings. Vitamin A which helps promote normal iron metabolism and the mintenance of normal mucous membranes, skin and vision. Vitamin B contribute to the production of energy, and normal metabolic functions. Vitamin C can support the normal function of the immune system and the protection of cells from oxidative stress. Vitamin D contributes to normal blood Calcium levels and the maintenance of normal bones and muscle function. VitaminE is a potent antioxidant and contributes to the protection of cells from oxidative stress. Zinc contributes to normal immune function, DNA synthesis and cell division. Copper helps to support the immune system and maintain connective tissue health. Not suitable for children under the age of 12 years old. Acidity Regulator (citric acid anhydrous, sodium bicarbonate),Sweetener (sorbitol, sodium saccharin), Flavour Enhancer (jam fruit flavour), Bulking Agent (maize starch), Natural Colour (redbeet powder).